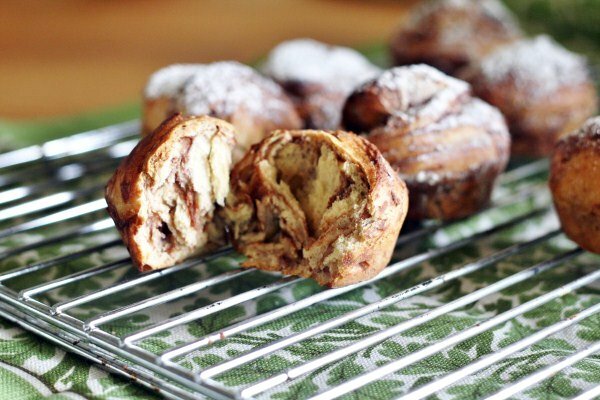 Nutella….brioche…all wrappped up and mooshed together a little into a scroll and served as individual muffins. And to think you have both of the recipes you need for these delicious morsels in your Everyday Cookbook! Nutella. It’s a weakness of mine, along with Lemon Butter. I simply cannot stop at just one mouthful (eaten from the jar, of course). My children didn’t know it existed until last year and I am quite proud that I managed to keep that one from them. So, even though the Thermomix version is so much healthier. I’m better not to have it in the house. After saying all that, these muffin/scrolls were for a special occasion. And special occasions call for special treats. They were on the menu of my gorgeous girlfriend’s birthday brunch…and a perfect brunch pastry they were. Brioche – from Thermomix Everyday Cookbook or Basic Cookbook. Preheat oven at 180’C and oil muffin tins. Make Nutella and Brioche components, as per instructions. Once the Brioche has risen, knock it down and roll it out into a large square. Spread half of the nutella down the middle third of the square and fold the inner thirds into the centre, as you do when making puff pastry. Then fold the long rectangle into thirds again. By now you should have a small, fat square. Roll out the square into a large square again and then spread with the remaining Nutella. Roll the square into a log to make a long scroll. By the way, it will be getting pretty messy by this stage. That’s OK! Slice pieces of the scroll off and place into each muffin hole. Bake in the oven for 20 minutes until cooked. Don’t over cook them, they are better a little gooey inside.